I’m excited to be invited to join in on the ABNH (A Blog Named Hero) 5 year anniversary hop today! You should have come here via the Hero Arts blog….if not, head back to the start of the hop at ABNH! I’m continuing with my marker week (sale ends today at Ellen Hutson – additional 10% off all markers), so I’ll use the Art & Graphic Twin markers from Zig Kuretake again today! I’ve been goofing around with stamps to see which kind work best with these pens – I was pretty sure some interesting effects could be had, and I was right! I had these birthday animals from Hero that I thought could work well. In the video you’ll see how I created the giraffe – and below, photos of some other animals I used the same technique for. Watch the video below or click HERE to see it in HD on YouTube. 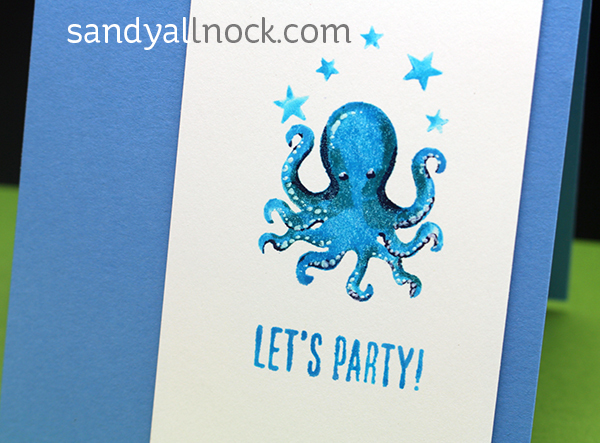 And how about a darling octopus? 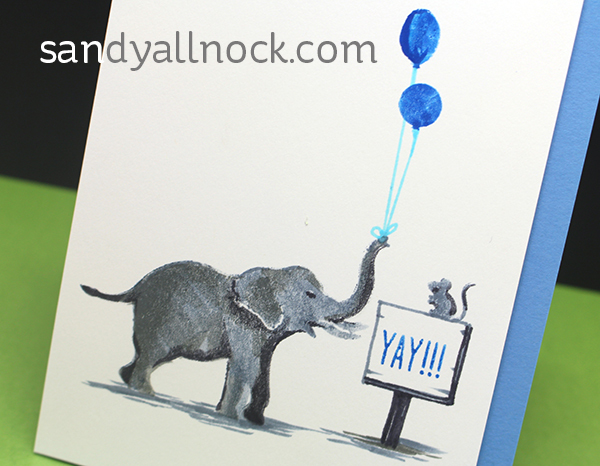 I used a variety of the blues (great selection in these markers) and white gel pen to add suction cup details. A Blog Named Hero is so thankful for their wonderful sponsors and collaborating companies! Several companies decided to help us celebrate our fifth anniversary with giveaways and they were so generous that we decided to spread the love over both hop days with different prizes to be won each day! Giveaway prizes total more than $400! To win, leave a comment on each hop stop. We will select winners randomly from different blogs so the more blogs you visit each day, the greater your chances of winning! And be sure to visit A Blog Named Hero on Sunday for the list of Sunday hoppers and prizes! Comments must be left before 11:59 PM EDT on Tuesday, March 28th and winners will be announced on March 30th. Your next stop is Coralynn Murray! Your cards are so bold and beautiful! Love them! I always learn something when I get a chance to stop by here. LOVE this technique! (and got a KICK out of Kanga and Yogi together!) 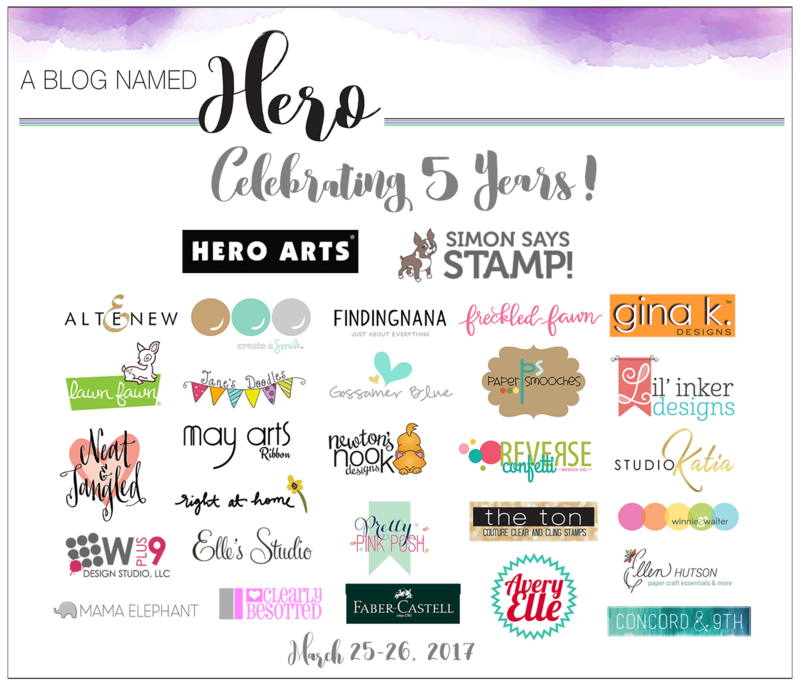 Huge congrats to A Blog Named Hero for their 5th anniversary! What a great way to color an image. Thanks for introducing us to this technique. This is so unique! Very cool. I love your videos – always such good descriptions, etc. 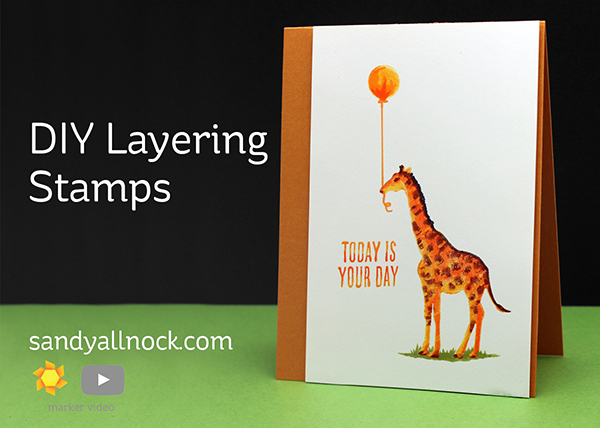 Thanks for sharing your cute layering cards. Sandy these are great! I love the way you layered these and brought them to “life”! Cute cards! Congrats “A Blog Named Hero on your birthday!” Thanks for a chance to win! Cute cards! I have just the ribbon to go with the giraffe stamp! Always looking for new ways to use colors and stamps thanks for sharing your technique! Great technique idea for those without layering stamps, thanks! Wow! Amazing technique today! Keep doing what you are doing because you are simply great at it! Thank for inspiring everybody here to continuing to make great cards! Thank you so much for sharing this technique. I have several solid stamps from HA kits that this technique would be so perfect for. Lovely cards. 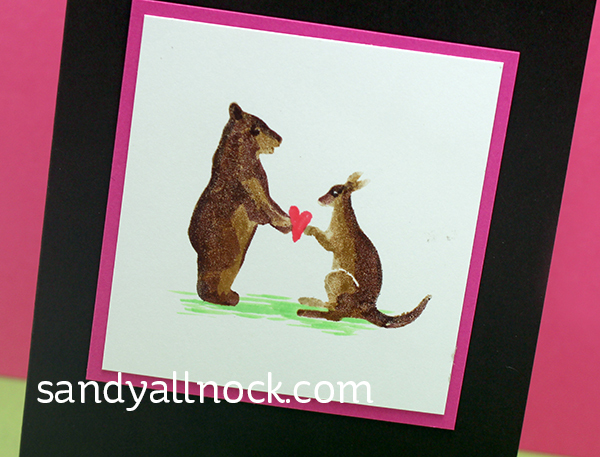 Always love to learn new ways to user my stamps and ways to color. Thanks for the inspiration. Great cards. I’m not sure I have the patience for that many markers. I like how the octopus seems so alive with the added details. These markers are really great; your coloring is beautiful! Love the stamp set, too.